My family(I,wife,2sons) is looking forward to accepting you! I am receiving positively not only a short-term stay but a long-term stay. ◆ Your 11 benefits of homestay in our house. (1) Close to the JR station. And,You can go to Shinjuku station in 40 minutes by the train from nearest staiton. (2) There are a toilet and a shower room for exclusive use of you in your room. (3) Supermarket, restaurant*1, banks, Convenience store*2, Post office are in the range of 5-minutes walk. *1 including Sushi,Ramen. *2 Seven-Eleven. (4) Clean air and No noise. (5) You can get travel adviser of you. It's me :-) Tomoyuki. (6)We sometimes offer you special Japanease meal my wife cooked from time to time.So delicious! (7)Let's go to various places with our family if you want!Traveling,Onsen(温泉),Japanease restaurant,sightseeing,shoping,hiking,playing sports and so on. (8)You can always use the WiFi in your room. 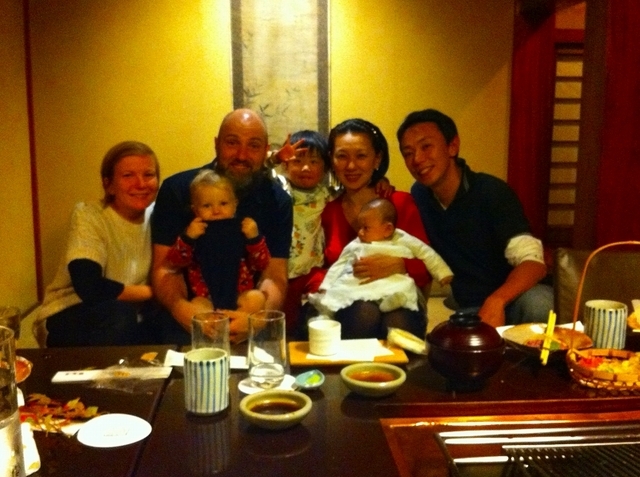 (9)You can experience Japanease traditional events with our family. (10)You have no curfew.So you can come home as you like. (11)You can get a discount If you will stay over a month.It is 75000yen per month. Our building was renovated a few years ago. Our Studio type place is 13㎡.We have a kitchen, a bathroom (shower, bathtub, Western style toilet) , Japanese style), and storing space. Table, air-conditioner, trash box, hair dryer, washing machine / laundry dryer, bicycle, FREE WI-FI, boiling machine. 5 minute walk to the closest station “Higashi nakagami”. Our house is located in a quiet suburb and you can enjoy the calm atmosphere. ※ There are several, a lot of, few, restaurants, daily necessities shop, you can walk within 5min. Time needed to go to the main area. Please search the above address on (website hidden) map. We are very easy going people. We do not enter the room and clean during your stay to protect your privacy. Near the famouse park(Showa Kinen Park) ,near the Higashi-Nakagami station(東中神駅),a supermarket in front of my house,near the Japanese traditional bathhouse(銭湯),and so on. Please have a great Christmas! He stayed for a month. She stayed for 5 months. She stayed for one year.